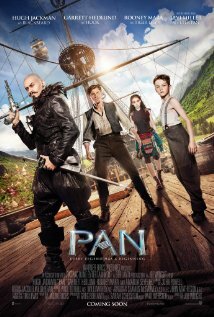 Pan open in Australian cinemas on September 24 and is distributed by Roadshow Films. To be released in the United States on October 9 and the United Kingdom on October 16. Pan comes in with the tidal wave of prequels and sequels to much loved family classics gracing our screens this year. J.M. Barrie's "Peter Pan" has already met it's sequel in 1991's Hook, but the idea of a prequel does spark interest as there are questions that need answering from the original. How did Peter Pan come to be the beloved warrior and leader of the Lost Boys? How does Peter Pan fly? Was he born in Neverland? What did become of his family? There is a great deal of potential there for a strong origins story about the boy who never grows up, all it needed was a good screenplay that answered these questions. The questions are absolutely answered, but the screenplay encompassing the story is incredibly weak and bitterly disappointing. Joe Wright's direction of all things intriguing and beautiful does little to enhance the flat dialogue he is faced with and what results is a film that knows the story it is trying to tell, but isn't sure how to tell it. During World War II, many children in London were orphaned and among them a rather mischievous small boy named Peter (Levi Miller), who was left on the step of an orphanage by his mother when he was a baby. He starts to notice that other boys have been disappearing at night and it is only a matter of time before he is one of the chosen ones who is shipped off to Neverland to serve the formidable pirate, Blackbeard (Hugh Jackman). Peter is one of the lucky ones who makes it out of Blackbeard's clutches alive and sets out on a journey across Neverland, as he is convinced that this is where the mother he has been searching for so long is living and waiting for him. What awaits for him is adventure like he never imagined and the realisation of how important he really is. The original story of "Peter Pan" was a tale for all ages and over the years has inspired many remakes and variations. Pan will inevitably draw comparisons to several of these films and while the production design and special effects are particularly stunning and superior to the large majority of predecessors, what it lacks in comparison is being a film for families as a whole. It is true, the screenplay is extremely basic in both dialogue and story so it is easy for children to follow. However, the film is also quite dark and can also be quite intimidating for little children on the big screen. Despite beautiful production design, the film lacks a great deal of well deserved colour, which is something the film is screaming for. The only scene which does impress with it's colour through lovely costume design is with the tribes, but this is not an appropriate scene for children as it is quite violent. On the other hand, Pan does come across as too basic for adults to fall in love with. The film is not an emotional experience nor are there any underlying themes to bring further meaning to it. There's also the especially strange inclusion of "Smells Like Teen Spirit" by Nirvana and "Hey Ho, Let's Go" by The Ramones which are sure to raise a few eyebrows due to their bizarre appearance in the film. 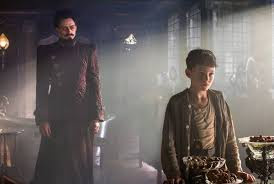 Pan also presents one with frustrating unanswered questions in its final moments and inconsistencies between the film and the original story. No sequel for this film is on the cards, so one cannot help but feel cheated when a gap in story is left between Pan and when he meets Wendy, Michael and John in "Peter Pan". Another strange decision by writer, Jason Fuchs is to include hints of flirting between Hook (Garrett Hedlund) and Tiger Lily (Rooney Mara), which seems a lame attempt purely to include some romance in the film. The characters themselves are also problematic. While Levi Miller is fine as Peter Pan and rather enjoyable, Blackbeard and Hook are badly constructed characters and Hook in particular is given some strange characteristics. Hugh Jackman's Blackbeard is not given much of a background story as to who he really is and how he came to be the evil man with no consideration for human life. Although Blackbeard does have some of the best lines in the film and it is Jackman's comedic timing that provides a source of entertainment. Garrett Hedlund's James Hook is incredibly exaggerated. Physically and vocally he resembles Indiana Jones more than the traditional idea of the man he is yet to become. Pan is a disappointment to it's film relatives. It acts as an adolescent who is still not quite sure who they are, but is attempting to be everything to everyone...which ultimately never works when you are trying too hard.